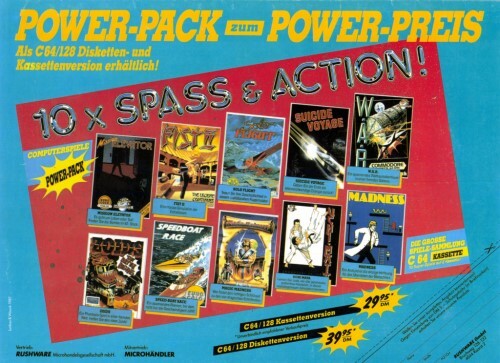 The computer games collection Power Pack Disk Compilation with 10 different computer games from the year 1987 by the company Rushware. The sales price at that time: 29,95 DM datasette or 39,95 DM diskette. The games collection Future Games 64, by Commodore, contains the same games. This page was last modified on 11 January 2010, at 21:25.